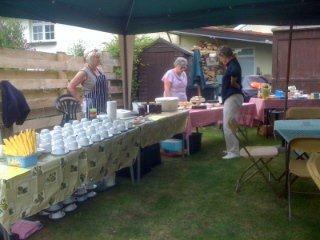 More than 50 supporters of St Andrew’s braved the inclement weather to enjoy a fresh, but slightly damp cream tea. Saturday 28 July was a rearranged date due to the horrendous 2012 summer. But still the garden at Church Cottage looked like ‘Gazebo City’ and the shelters were needed to protect stalls and customers from the ever threatening showers. Thick winter coats and warm clothing were the dress code for the day and at one point we considered lighting the BBQ just for some additional heat! However, in true British style, all those present managed to make the afternoon seem like a warm summer day. The delicious scones and cakes more than made up for the damp, cold conditions. Thanks to the efforts of all those involved some £300.00 was raised. The monies will be well used in the challenge of maintaining the heart of the parish – St Andrew’s Church.